Here’s a confession: The only reason I picked up this book was because of its fabulous lettering. The cover is gorgeous. The second thing that caught my attention was that this is the author’s first novel. I love reading debuts if only for the frame of reference. It’s nice to know where a writer began. Then I read the inside flap and quick-Googled a review. I found the hardback at our local used bookshop, so the price was right. Sold. The story centers around five people, all interwoven on the fictional Westish College campus on the shore of Lake Michigan. First, there’s Henry, a baseball prodigy that Mike Schwartz takes under his wing to train and instruct. Mike is a year ahead of Henry and poised to enter law school upon graduation. Henry’s roommate is Owen, an openly gay and impeccably sharp student athlete who indulges in a relationship with the most unlikely person. College president Guert Affenlight is beloved on campus, yet as a never-married, once-a-heartthrob sixty-something year old, he’s still searching for real love. And finally, there’s President Affenlight’s daughter, Pella. She’s just hopped on a plane from San Fransisco, leaving her husband behind for good. The only place she knows to go is Westish. One can assume these five people have a myriad of interactions that propel the story forward. Chad Harbach approaches each point of view with an authentic voice so you don’t feel like you’re “head jumping” and unable to keep track. Some assumptions are easy to make, others not so much. 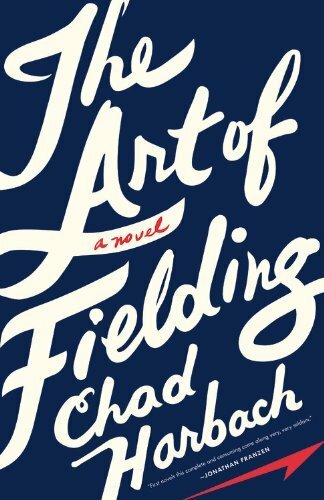 Against the backdrop of baseball, The Art of Fielding is about difficult relationships, sacrifices unrequited, and the lengths we’ll go to find some version of love and acceptance. It’s a beautiful story, and even though I’m not a baseball fan I can appreciate the parallels Harbach draws between choices made both on and off the field. You can’t help but root for everyone to succeed in all endeavors. For what it’s worth, the end was my favorite part. Buy The Art of Fielding here.